Apricots remind me of sunrise; the colours of their soft, downy skin going from golden through to deep orange, occasionally nudging red. They are fantastic teamed with raspberries, especially when served with these unusual little cakes, which are scented with sprigs of lemon thyme. Make sure you use young thyme with fresh, green stems, not old, woody sprigs. Put the milk in a large pan with 3-4 stems of lemon thyme. Bring to the boil and simmer for 2-3 minutes. Remove the thyme, then add the rice, butter, and sugar. Return to a simmer and cook for 25-30 minutes, stirring often, until the rice is soft and the mixture thick. Transfer to a bowl. Leave to cool completely. Preheat the oven to 180ºC, gas mark 4. Butter a 12-cup muffin tin (with cups 3cm-4cm deep). Line the base of each cup with a disc of baking parchment. Butter the parchment and scatter with caster sugar. Put a stem of thyme into each cup. Stir the lemon zest into the rice. Add the polenta and egg yolks. Whisk the egg whites till they hold firm peaks and fold into the mixture. Spoon into the cups, filling them to the top. Bake for 15-20 minutes, until firm and golden. Cool for 10 minutes then run a knife around the edge of each cup to loosen, and turn the cakes on to a cooling rack. Remove the parchment, and leave till cold. Meanwhile, put the apricots and raspberries in a bowl. Stir in the framboise and caster sugar. Whip the Mascarpone briefly. 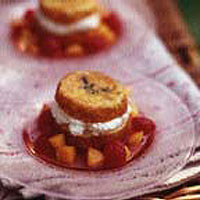 Cut the cakes in half and sandwich with the Mascarpone. Dust with caster sugar and serve with the apricot and raspberry salsa.